As a start up company Tax Retriever are part of The Recoup Group Limited who provide specialist tax reclaim services for UK tax payers. 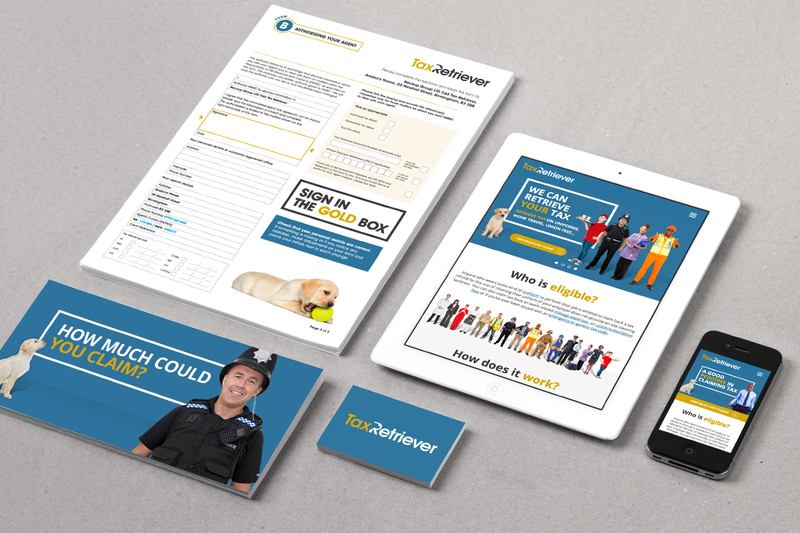 Tax Retriever provide a B2C tax retrieval service direct to individuals as well as delivering an enhanced employee engagement and well-being benefits B2B package to companies via a simple, pain free reclaim process. As part of a pitch process the threeguru creative team were challenged to turn an ingenious business idea into an instantly recognisable brand in the space of just 10 short weeks. With time of the essence our strategic, creative and digital gurus wasted no time in developing the Tax Retriever brand name, logo and retriever logo form branding. A series of green screen filmed short videos were also produced, with the help of new found our canine friend, to grab consumers attention via a targeted social media campaign. In the first week following its launch the Tax Retriever brand has already acquired an impressive 1,891 Facebook followers.